Our ladder less, pure water fed poles enable us to quickly and effectively clean your windows with the utmost privacy, discretion and minimum disturbance to you, and outdoor areas such as lawns and flower beds. We can also clean hard to reach windows up to 50 feet high, and conservatories. Ladder less technology means our feet remain safely on the ground ensuring the safety of our staff. Traditional window cleaning can also be used on ground floor level, where safe and necessary. 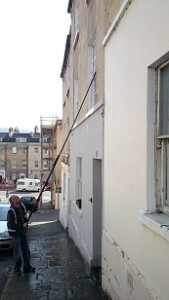 One of our window cleaners using water fed pole cleaning in Bath.